Magic!! 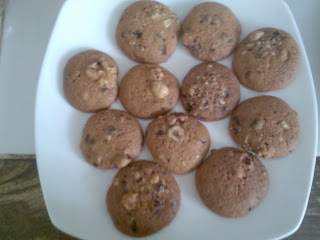 Yummy choc chip with hazelnuts! 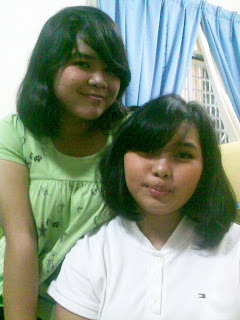 Last night my dad's siblings & my cousins came for berbuka puasa.It lasted until midnight!I even managed to put my makeup skills to good use on 2 of my lil cousins.The one on the left is Ika(the eldest of 3 sisters),who's 16 years old & studies at Sri Aman while on the right is Syazana(the eldest & only girl with 3 brothers--just like me!) who's 15 & studying at TTDI Jaya.I gave a pair of my Voir wooden heels to Syazana cos' it doesn't fit me.Shared beauty tips with em' & gave my creme caramel recipe that I made for berbuka to Ika.Both of them has their own blogs so I'll link em' up soon & I'm definitely going to edit their grammar..haha. 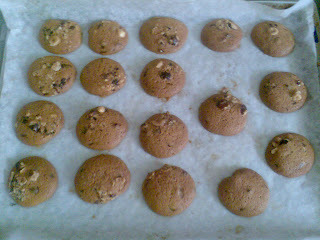 Mak Tam(Ika's mum) took my choc chip recipe which I only give to family members because it taste EXACTLY like Famous Amos.And mine doesn't taste cloyingly sweet cos' my tooth tend to hurt when I eat Famous Amos due to too much sugar in it.The ingredients are just flour,butter,brown sugar,white sugar,salt,baking soda(not powder! 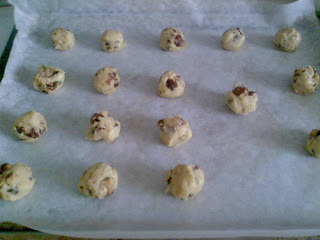 ),vanilla essence & egg.BUT the key to make good choc chip cookies that taste exactly like Famous Amos lies on how many parts of each ingredients should we put & which one goes first...That's a secret I never tell..XOXO..:). Only a few more days before Gossip Girl season 3 premiers..Can't wait! perlukan pembantu? sedia bekerja sehingga lewat malam. hubungi saya. hahahahaha. nnt if aku dpt duit nk order juga tau! iqa...give me ur blog link & i'll link u up later!